Newsday is the United States’ eighth-largest newspaper, so when it set up a “pay wall” at its web site in November, media circles buzzed. Could Newsday prove that forcing people to pay to read online newspaper content is a viable business model? Could Newsday, an example of a large local paper with a lock on a region’s news, use its unique editorial to build subscriptions online? Early indications are — nope. 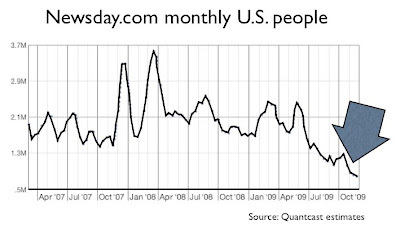 Quantcast data shows monthly U.S. traffic, which had hovered for years in the 1.3 to 2.5 million person range, suddenly fell off a cliff to just over 600,000 individual people. Newsday may be hamstrung by the fact its web site is incredibly confusing to navigate for nonsubscribers — quick, click to Newsday.com and try to determine in 5 seconds how to sign up. But this failing experiment can’t make print publishers happy as they reconsider making readers pay for online content. The buzz is new tablet devices may give subscriptions a boost. Be careful, publishers. The long tail of substitutes is just a click away.